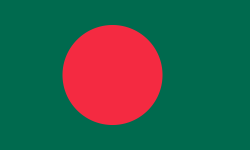 The Bengali flag features a bright red disc on a green field. The flag is quite simple, but it has significant meaning behind the design. The red disc has two distinct meanings. First, it represents to sun rising over the nation. Next, it also represents the bloodshed for those who fought for the country’s independence. The green field of the flag represents the beauty of the land of Bangladesh. The Bengali flag is just two colors: red and green. These two simple colors have given it its nickname of “The Red & Green.” As previously mentioned, the red represents both the rising sun and the bloodshed of those defending the nation, while the green is representative of the lush land of Bangladesh. The first design of the modern flag was first created in 1970. It was made by a group of students at Dhaka University. The original flag was sewn using donated clothing. The original design featured a map of Bangladesh in the center. The map was yellow in color. The first version was traced from an atlas before being painted by the students. This version of the flag was first flown on March 2, 1971 at the university. The next year, the flag was modified. This included removing the yellow map of the country, as well as moving the red disc toward the hoist. It was said that the map was removed because of the difficulty of properly rendering it on both sides of the flag. The revised version was officially adopted as the national flag on January 17, 1972. Many government officials, including the president, prime minister and the chief justice, are required to fly the national flag at their official residences. The flag is flown on public and private establishments on days including Independence Day, Victory Day, Muhammad’s birthday and other days designated by the Bengali government. The flag is flown at half-mast during International Mother Language Day, National Mourning Day and other days designated by the government. In 2013, residents gathered to create a human flag, landing the country a world record for the largest human national flag in the world.